At West Ballantyne animal hospital, we love animals with all our hearts and we encourage every pet owner to go through every possible measure to keep their cats and dogs as happy and healthy as possible. However, there are a lot of kitty owners who wonder if cat vaccination is appropriate when their pet spends all their time indoors. We know the ins and outs of cat vaccination here at West Ballantyne Animal Hospital, and we want you to be as informed as possible. 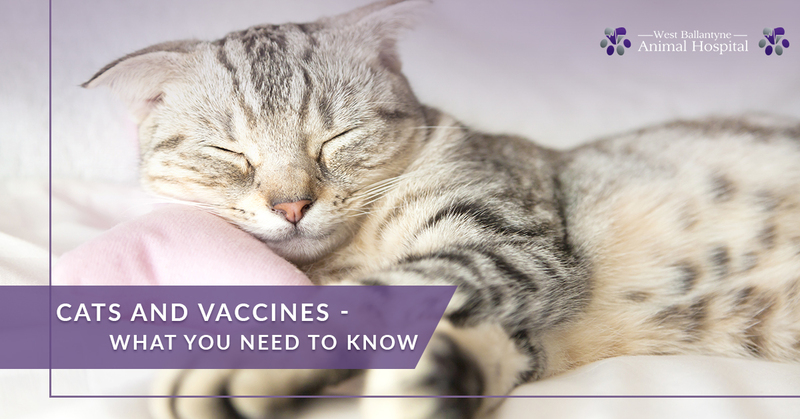 In this blog post, we’ll explore some of the facts behind vaccinations and indoor cats, so you can form a plan that’s best for your feline friend. Regardless of whether or not your kitty spends time outside, there are certain cat vaccines that are seen as essential by the overwhelming majority of veterinarians and animal hospitals. Most animal shelters and adoption centers make these mandatory, and there are some states that require you to carry out certain vaccinations. The most common mandatory vaccinations are the FVRCP (Feline Rhinotracheitis, Calicivirus, Panleukopenia), Leukemia, and Rabies. We recommend that every kitten receive the FVRCP vaccine, and the other two, while more relevant for outdoor cats, are significant enough that it’s usually a good call for indoor cats to get them as well. Why Should My Indoor Cat Get Vaccines if They Don’t Go Outside? Your Cat Could Accidentally Escape: Every cat is different, and some of them feel the call of the wild on the daily. We know you’re taking every preventative step, but there is always a possibility that, somehow, your cat could escape. It’s best to be prepared if they do. Contact With Other Cats: If your cat escapes and is brought to a shelter, he could be exposed to other sick animals. Or, perhaps you bring a new kitty home someday who was in contact with other cats at the adoption center. In both instances, there is a possibility of your pets getting sick. Cats Can Carry Latent Diseases: Some viruses, such as feline herpesvirus, aren’t completely annihilated by vaccines. Diseases can exist in a latent state in your cat, flaring up during times of stress or weakness. Vaccines can help to keep these viruses in check. The Disease Can Find its Way Into Your Home: Just because your cat stays inside doesn’t mean that diseases can’t find their way in. Mosquitoes, fleas, and wild animals all have the chance of penetrating your home’s defenses and making your pets sick. At the end of the day, you shouldn’t solely heed the advice of one blog post for your cat vaccinations. We recommend vaccine plans based on age, previous vaccine history, and risk of exposure. Regardless of whether or not you want to go ahead with certain cat vaccines, you should take the important step of consulting with your nearby veterinarian to diagnose the specific needs of your kitty. As West Ballantyne Animal Hospital, we serve all cat owners in and around the Ballantyne, Charlotte, and Pineville areas. Contact us today!